It is remarkable that someone with his lack of concern about consequences survived the war in which he was often put in positions of danger, occasionally because he was a Jew, and often because he had attracted the negative attention of someone of a higher rank. 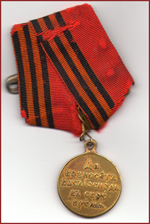 One of those dangerous incidents earned this medal: The front shows the dates of the war: 1904-1905, while the reverse (as it has been translated for me) reads: “Let God embrace you when it is time.” This doesn’t sound like an award for distinguishing one’s self in battle, but more like a prayer for someone taking on a dangerous mission. But maybe I don’t understand the Russian mentality. It is both ironic and tragic that, after surviving poverty and starvation, a war for which the army was completely unprepared, the revolutionary movement, three death sentences, and Siberia, my grandfather would ultimately be felled by an ordinary heart attack — and on the very eve of the day he and my mother were to have begun translating his diaries. Jacob Marateck His legacy, in the form of the 28 notebooks in which he recorded his experiences, has kept his spirit alive for two generations. With the publication of this book, the character of a man who lived by his principles (regardless of the consequences) and never failed to see the lighter side of any situation, can now be shared with the generations that follow.